My underwater photography setup is not a spiffy camera and a bank of lights, but a point-and-shoot Canon S 90 in a waterproof housing. It doesn’t have tremendous zoom capabilities so I’m constantly experimenting with ways to approach fish so I can get a decent close photo. Taking photos in areas where fishing, spearfishing, and fish collection are banned makes things easier. Fish in those areas seem to know they have less to worry about, at least from humans, so they’re less inclined to dart off. Elsewhere it’s a different story. Often I can get reasonably close, but when I raise my camera toward them they tend to zip away, possibly thinking it’s a new type of spear gun. The best approach I’ve found is to be as quiet as possible in the water and just drift toward something I want to photograph. In this instance, I was puttering around when I saw this giant porcupinefish headed my way. I like these fish with their big eyes and a body tapering from the huge head back toward the delicate tailfin. 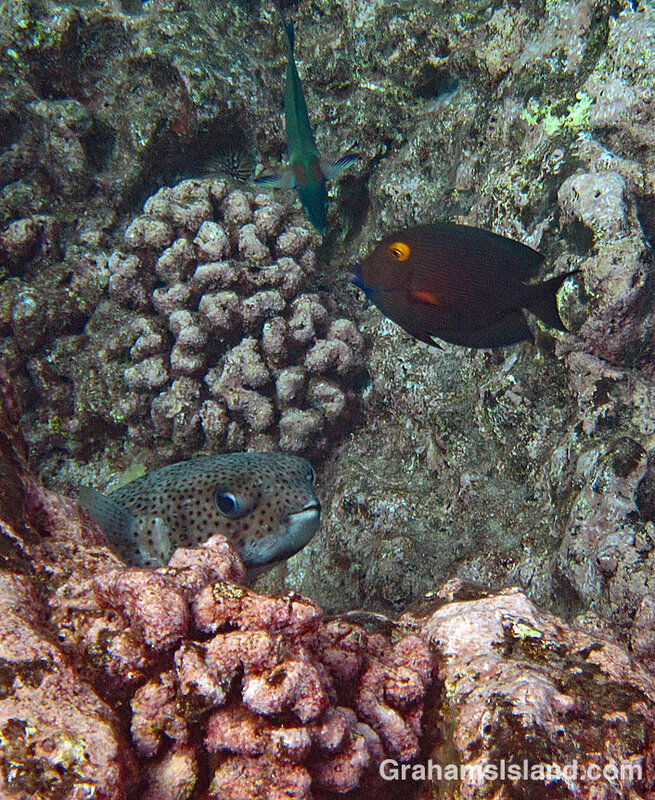 This fish spotted me and dipped down behind a large lump of rock and coral. I waited, but it didn’t reappear. I eased forward, keeping the rock between me and the fish. Still no sign of my quarry, so I slid to one side and saw the tailfin fluttering. Ah ha! With my camera ready and a gentle flip of my flippers I moved to the other side where I found the fish peeking out and giving me this look. I snapped a photo and an instant later the porcupinefish pivoted and headed the other way at speed. Despite their ungainly appearance, giant porcupinefish are good swimmers and it was soon a good distance away, but when I got home I was happy to find that I’d got this shot. I also like how the goldring surgeonfish in the photo looks suitably startled by the whole encounter.